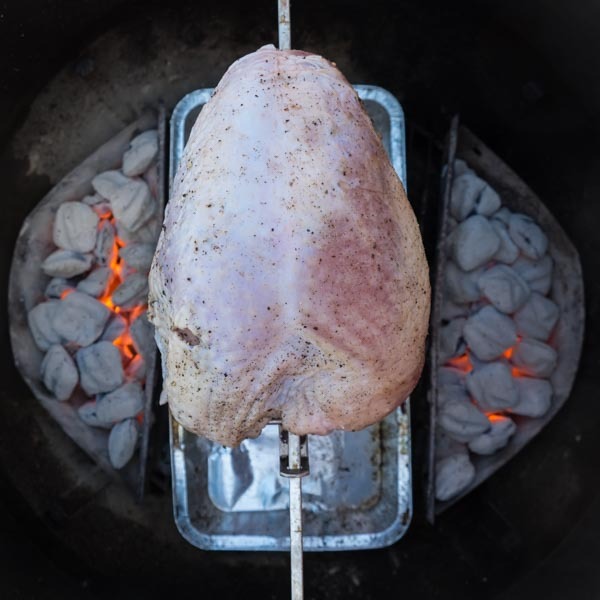 This recipe is from Mike Vrobel’s new cookbook in the How to Rotisserie Grill series, Rotisserie Turkey: 29 Recipes for Turkey on Your Grill’s Rotisserie. To perk up a bland turkey breast, I rub it with an Italian-inspired blend of coarsely ground spices. That blend includes a big dose of red pepper flakes and black pepper, adding a spicy kick to contrast with the neutral meat. Eight hours to 1 day before it is time to cook, pat the turkey breast dry with paper towels. Cut the extra skin away from the neck. Check inside the neck cavity, and discard any big pieces of fat. Gently work the skin loose from the turkey breast starting from the back of the bird, and rub 1 teaspoon of the brine directly on the meat. Pull the skin back into place, then sprinkle the rest of the brine over the turkey breast, inside and out. Put the turkey breast in a baking dish and let it rest in the refrigerator, uncovered, overnight or up to 24 hours. One hour before cooking, remove the turkey breast from the refrigerator. Skewer the breast on the rotisserie spit, securing it with the spit forks. Let it rest at room temperature until it is time to cook. Put the spit on the grill, start the rotisserie spinning, and make sure the drip pan is centered under the turkey. Close the lid. If you are using a charcoal grill, add 16 unlit briquettes after an hour to keep the heat going. Cook until the turkey breast reaches 165°F in its thickest part (about 1 ¾ hours), then add 5 minutes more cooking time. Remove the turkey from the grill and remove the spit from the turkey. Let the turkey rest for 20-30% of the cooktime before carving. Cut the breast halves from the keel bone and ribcage, then carve the breast into ¼-inch-thick slices. Arrange the turkey slices on a platter and serve. Adapted from: How to Rotisserie Grill: Rotisserie Turkey by Mike Vrobel. Visit Mike at DadCooksDinner.com.